Part of any successful SEO strategy is choosing the right keywords. Let’s take a look at how you can use Google’s keyword suggestion tool effectively. 2 Why Use the Google Keyword Suggestion Tool? Keywords can be found throughout websites, internet resources pages, blogs and even photo sharing sites as well as on social media. They are central to the function of search engines, and should contain words or phrases that customers will use when searching for online goods or services. From a single word through to entire phrases, high quality, relevant keywords will help your customers to find you. Undertaking keyword research, and understanding what words and phrases your potential customers may use when they are searching for your site online, is vital to compiling lists of keywords that are relevant to your business. Every website needs clear, concise and well thought out keywords and phrases to ensure that it can be found in relevant search enquiries. Why Use the Google Keyword Suggestion Tool? Though the Google keyword suggestion tool was mainly created for AdWords users, it is still an effective aid for choosing the best keywords, even for those not using AdWords. It can be a great help for anyone who wants to increase their search engine rankings and have more visitors to their website. In addition to giving you great keyword ideas to use for your website, Google’s keyword suggestion tool also provides accurate estimates of monthly search volumes for specific keywords. As any good online marketer knows, choosing the right keywords is absolutely essential to achieve great rankings. The tool also allows you to see the level of competition each keyword currently has. But keep in mind that this indication – high, medium or low – refers to the competition within AdWords, in other words, competitors who use Google AdWords. It does not refer to the level of difficulty in ranking for this keyword. Also, keep in mind that you should choose the location that you want your website to rank for. If you keep your settings on a global scale, it may influence your possible ranking level. This is because you will likely rank much higher in your country then compared to worldwide competitors. To start using the keyword suggestion tool, you’ll first need to sign in to your Google AdWords account. 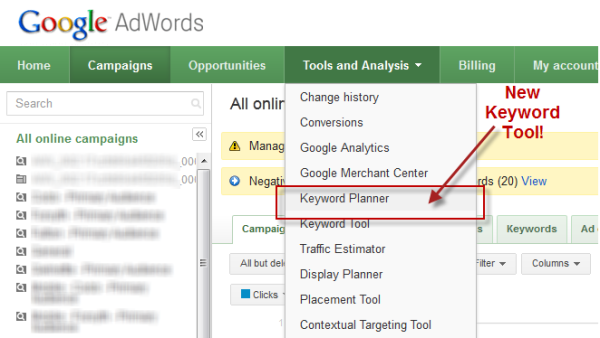 From here, go to the ‘Tools and Analysis’ menu and select the ‘Keyword Planner’ option. If you don’t yet have a Google AdWords account, you can easily create one, and it’s free. You will then be presented with three options. You can either choose to ‘Search for keyword and ad group ideas’, ‘Enter or upload keywords to get estimates’, or ‘Multiply keyword lists to get estimates’. Choose the ‘Search for keyword and ad group ideas’ option. Here you can use a variety of tools to get a list of keywords that you can use. You can start by typing in a word or phrase that is relevant to your business. You can also choose to enter a landing page (either on your own site or one of your competitors’ websites) so that the keyword tool can scan and find relevant keywords for those pages. Alternatively, you can select from the list of predefined keyword categories. A good rule of thumb is to start with around five or 10 keywords that accurately describe your business. You can include specific keywords as well as broader phrases that you think people search for. 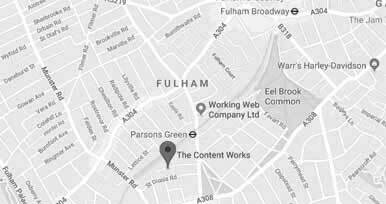 Remember to include locations within your keywords. Add the list of keywords to the ‘Your product or service’ field. Click on ‘Get ideas’. You can also change the tab on top from ‘Ad group ideas’ to ‘Keyword ideas’. Here you will get a detailed list of the statistics that go with the keywords you have entered. The results will include the average monthly search volume for each keyword. This is a good indication of how popular the keyword is, i.e. how often people search for the specific product or service. Once you have this list available, it’s a great place to start planning your content and SEO strategy. Since you’ll be getting the search volume information too, you can accurately determine which keywords will be more important to focus on and sort your list accordingly. The tool also allows you download this keyword list as a .csv file, a very handy piece of information to have on record which you can then use to further expand your keyword research. You can then choose to modify your search, and use anyone other two remaining options. This includes searching for keywords from a specific landing page. You can also download this .csv file. Once you have downloaded the files, open them on your local computer and sort the list of keywords according to the monthly search for you. Remember to remove any duplicate keywords. By using these and combining these results, you should get a very accurate list of keywords to use. After using the keyword suggestion tool you will now have anywhere between 10 and 100 keywords that you can use for your website. You can continue to filter this list until you have the right keywords that are relevant to the products and services you offer. You can then use these keywords within your SEO efforts, to help boost your search engine rankings and improve your link building profile. Remember that you should always create great quality content for your website, and this includes using these keywords naturally within your pages. This tool is used by thousands of marketers on a daily basis, as it’s an accurate way of getting details on relevant keyword suggestions from Google. By getting a list of relevant keywords for your website, you’ll be on your way to build a solid foundation for your SEO plan. You can regularly update these keywords and also expand your list as time goes by. If you plan on using Google AdWords for your PPC campaigns, you can start small and choose only a handful of relevant, high ranking websites. As your budget increases, you can also increase your ad spend. ← Should You Link Out to Other Websites? For a long term, Google Keyword Planner was one of the best suggestion tools for keyword researching. But at some point, users became limited in the important functions. As a result, there are two problems every SEO master have in using that tool. 1. You need to have an Google Adwords account to have an access to Keyword Planner and and make a research. But in many cases you don’t need it at this time. 2. You can’t see an exact match of average monthly searches for results. Divarication is too big that such information have no valuable to us.